Like the title says “Great Nature G Guardian & Success Support”. AUTO: [Counter Blast 1] When this Unit is placed on (GC), you can pay the cost. If you pay it, choose 1 of your Rear-guards, for each of your Circles that has no Unit, during that battle, that Unit and your Vanguard gain Power+4000. Afterwards, if the chosen Unit has 20000 or more Power, draw 1 card. AUTO (RC) 1/Turn: When this Unit Boosts, during that turn, this Unit gains “AUTO: When this Unit is retired from (RC) during the End Phase, draw 1 card. And, if it was Retired while Successful, you can place this card on the bottom of the Deck.”. For Today’s Card, we’re introducing the following from the Extra Booster “The AWAKENING ZOO” (on sale December 8th, 2017), the 《Great Nature》 Ｇ Guardian “Eternity Professor, Sankarpa” and 【Success】 Support Card, “Fitness Group, Maosh”. “Eternity Professor, Sankarpa” is a G Guardian that draws and buffs cards. When placed on the Guardian Circle, you can pay 1 Counter Blast, and then choose 1 ally Rear-guard, and for each of your Circles with no Units, during that battle, the chosen Rear-guard and your Vanguard gain Power+000. And if the chosen Rear-guard’s Power is 20000 or more, you can draw 1 card! And since you can increase the number of Rear-guard Circles without Units via “Retire at the end of the Turn” Skills, this Skill works great with any 《Great Nature》 Deck. Also, since 《Great Nature》 has a ton of Cost Recovery Skills, you can easily convert surplus Counter Blasts into Draws. And, the Grade 1 “Fitness Group, Maosh”, when it Boosts, gains the following Skill: “When this card is Retired, draw 1 card, and when you Retire it while Successful, you can place this card on the bottom of your Deck.”. 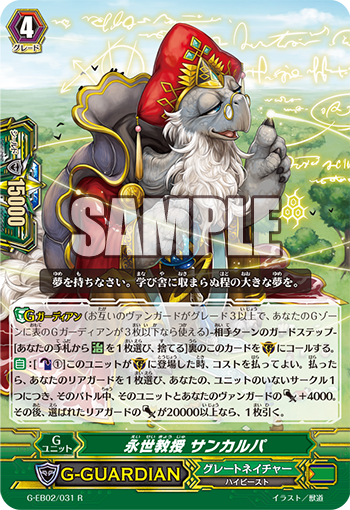 When the turn ends, if it’s Retired by an Ally’s Skill (making it quite compatiable with “Bigbelly”), and since it’s not tied to Generation Break, it works well with Skills that can be used early on, of cards like “Binoculus Tiger”. This card makes 【Success】 Decks evenn stronger! We’ll be introducing Extra Booster “The AWAKENING ZOO” after today! Please look forward to it!